Treat your employees and customers to freshly brewed coffee. Coffee Pros is an office coffee service based in Anderson, Indiana, that serves offices, restaurants, and food service organizations throughout the state. Our product menu offers all the brands that your employees, customers, and guests love. People who love coffee care about where their beans come from. We choose the finest gourmet roasts from top companies like Copper Moon World Coffees, Community Coffee, and John Conti Coffee. Single-serving coffee systems are also available from industry-leader Keurig™. Every business is different, so we don't try to provide a one-size-fits-all solution. A small office might need a Keurig machine, while a hotel might require a commercial food-service brewer. We specialize in creating custom programs designed to meet your specific needs and tastes. 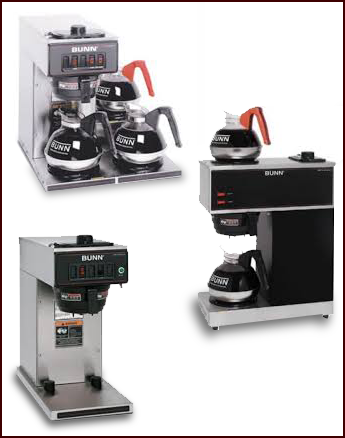 No matter how many employees, guests, or customers your business has, Coffee Pros has the answer to your commercial beverage needs. This flexibility, combined with our statewide route system, makes us Indiana's favorite office coffee service. Join the single-cup revolution! Single-serve brewers are easy to use and easy to clean. Your employees can enjoy a hot beverage from a wide variety of options in just minutes. Each drink is individually packaged for ultimate freshness. Imagine a variety of drink options, available 24 hours a day with no mess. Now that's a coffee service that will keep employees happy! Coffee is the just the beginning. There's something for everyone at Coffee Pros. We offer a line of delicious teas and a state-of-the-art water filtration system that provides premium drinking water directly from the tap. This filtered water is perfect for brewing hot beverages or for drinking on its own. Small, medium, and large ice machines are also available for making refreshing iced drinks.